Unless you have been living under a rock, you should know that the Mixed Martial Arts or MMA has been gaining popularity around the world. Even if you have been living under a rock, there is still a good chance you know a little about the sport. Anyone with basic internet connection would not be able to avoid anything with regards to the UFC. If you were in a coma, well then it's okay. Mixed Martial Arts or MMA is a new sport that mixes K1 style kickboxing with the elbows and knees of Muay Thai, and with a huge dash of grappling/ground fighting. There is a lot to take in to understand UFC Undisputed 3 and it might scare off newcomers. The developers help new players ease into the game with a very thorough video tutorial, telling you how to properly execute strikes, transition and submissions. A new Amateur control method has also been added to make it easier for new players to perform certain moves such as transitioning guards. Even with all this, there’s still a daunting amount of information that will be thrown at you and proper execution of whatever you’ve learnt in the tutorial needs practice and experience. Commit an hour to the tutorial and the rest of the game will become a lot more enjoyable. Once you got the controls down, the fights begin. Bouts in this game is a highly complicated chess match involving punches and kicks; gauging distance, throwing attacks and properly defending yourself is key to survival. With all of the different moves at your disposal, this can be handled in a multitude of ways; it can be as simple as constantly mashing crosses and hooks until a single lucky blow knocks your opponent out or it can be as complicated as a fighting game, combo-ing on offense, swaying to avoid blows, transitioning between standing and ground fighting, and putting your opponent into submission holds. While fighting, you’ll experience the beauty of the game’s graphics, depicting the struggle for survival so accurately you might think the fight is real. Over the cheers of the fans, you can even hear your trainer give you advice on what you’re doing right and wrong and what you should try doing next. The trainer’s advice can be very useful in a game where it’s easy to forget every possible move you can make. All of this makes the overall experience amazing. The inclusion of the now defunct PRIDE championship forces players to adapt to the different rules: head stomps and kicks on a downed opponent and 10 minute rounds etc. It would’ve been nice to see this fleshed out even more with its own Career and Title Defense modes, but this is a great first step. 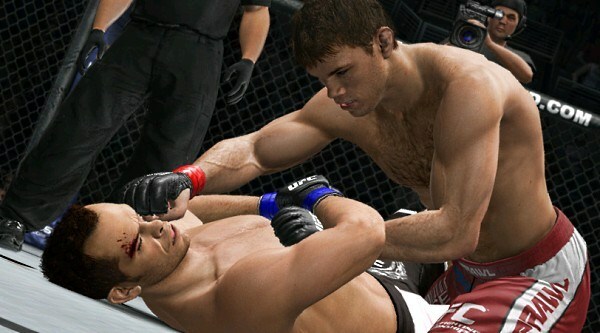 UFC Undisputed 3 is not just the best MMA game on the market. But it’s so well-crafted that it would attract both MMA fans and newcomers alike. There is so much to enjoy in this package, for people in various levels of UFC fandom, that even those who are on the fence should try UFC Undisputed 3; they may just find themselves a new passion.